What a nice surprise this morning when I stepped on the scale! 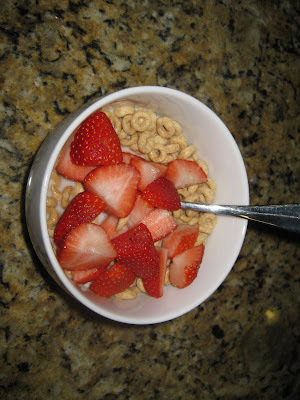 Breakfast was Honey Nut Cheerios and strawberries in almond milk. 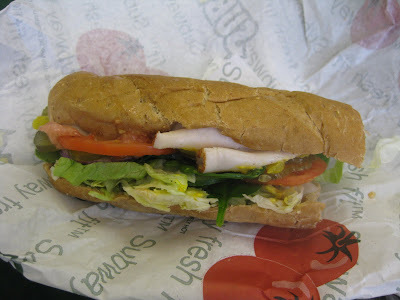 I had a serious craving for it this morning! Don't understand why the picture is sideways though! I went over to Lisa's for some more P90X action. Today's video was Legs/Back and Abs. The leg video was challenging but it wasn't as hard as I thought it was going to be so that was nice! I came home and changed and then I had Lisa come with me to Home Depot to pick out some new light bulbs for my kitchen. Mine were too bright and white so she picked out a softer white for me. I stink at this sort of stuff. Now my kitchen looks and feels much warmer. We went to Starbucks afterwards. I tried a new drink: skinny cinnamon dolce latte. I usually get the vanilla version but thought I'd give this one a try. At first I didn't like it....I thought it had too much cinnamon flavor but then it began to grow on me and I ended up liking it. I still like the vanilla better but it's a nice change of pace. I then went to Trader Joe's and Ralph's to load up on the week's groceries....in the pouring rain. Ugh.....I was soaked when I got home so I changed my clothes and got down to work paying bills, checking email, etc. Soup sounded really good for dinner so that's what I had. 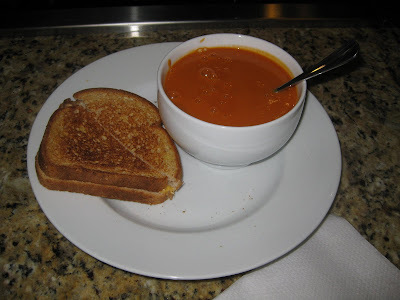 Tomato/Roasted Red Pepper soup and a grilled cheese sandwich made with light wheat bread and light cheese. I lost one half of the sandwich to my son so I only ate one half and half of the soup. I got full very fast.....strange. I re-took my Weight Watcher points quiz and it turns out I'm losing a point. I'm down from 24 to 23. That's not very nice!!!! That's about it folks. I hope everyone had a nice Monday. Hasta la manana! your breakfast looks really good! how is almond milk? it sounds so interesting! I am going to be starting p90x tomorrow and can't freaking waittt!! Tomato Soup is one of my favs. If you like Almond milk try Hemp milk... it tastes better and it has calcium so you will be consuming the same number of points but gaining more nutrients for the same points.. I love almond milk. :-) And looking forward to the Special K Granola review. I've seen it, but didn't buy it. PS- I nominated you for a Beautiful Blogger Award...check my recent post. Nice job on the P90x!! I haven't ever tried one of those workouts! !